This illustration shows the anatomical view of the muscles of the dog. I worked with a plaster cast of an English Pointer as a reference and reconstructed the muscles with the help of anatomy books. To be able to do that I made a sketch of the dog skeleton first. With the important palpable bony landmarks in place I was able to place the muscles. For the technique I used a pencil drawing as one would use an under painting for a painting. 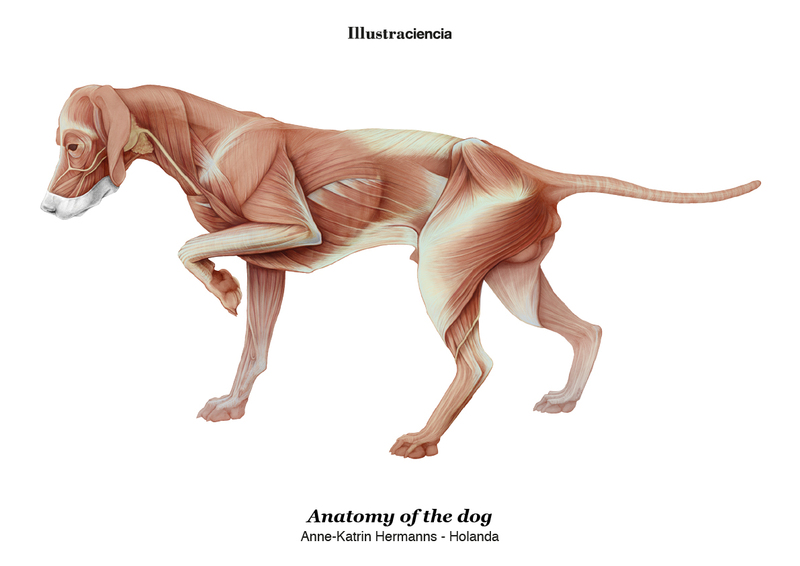 In a digital illustration programme I produced the coloured version of the anatomical view of the muscles of the dog and merged these two layers. By merging them you get a digital illustration with a non-digital feel due to the grain of the paper used in the graphite drawing.